Aharon Appelfeld was an Israeli author, professor and Holocaust survivor. He arrived in the land of Israel in 1946 from a Displaced Persons Camp. Often drawing upon his childhood experiences, many of his works depict European Jews in the World War II era. Titles such as For Every Sin, Tzili, Iron Tracks and The Healer gained him notoriety as a writer. 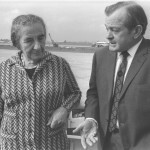 He received the Bialik Prize in 1979 and the Israel Prize in 1983. Appelfeld passed away in January 2018.